There were many staff at Kensington Palace, fulfilling many roles; a man who was employed to catch rats, another whose job it was to sweep the chimneys. 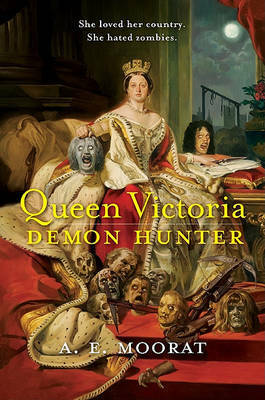 That there was someone expected to hunt demons did not shock the new Queen; that it was to be her was something of a surprise.London, 1838. Queen Victoria is crowned; she receives the orb, the scepter, and an arsenal of bloodstained weaponry. If Britain is about to become the greatest power of the age, there's the small matter of the undead to take care of first. Demons stalk the crown, and political ambitions have unleashed ravening hordes of zombies even within the nobility itself.But rather than dreams of demon hunting, Queen Victoria's thoughts are occupied by Prince Albert. Can she dedicate her life to saving her country when her heart belongs elsewhere?With lashings of glistening entrails, decapitations, zombies, and foul demons, this masterly new portrait will give a fresh understanding of a remarkable woman, a legendary monarch, and quite possibly the best demon hunter the world has ever seen.In another incarnation as a more serious (though still satirical) author, A. E. MOORAT has won critical acclaim and been shortlisted for awards. Here, however, he was chained in the dungeon, fed tea and ghost stories, and kept busy writing the adventures of Queen Victoria, Demon Hunter.